The United Nations periodically publishes World Urbanization Prospects. One of the highlights is both historic and projected detailed population information for individual cities around the world. 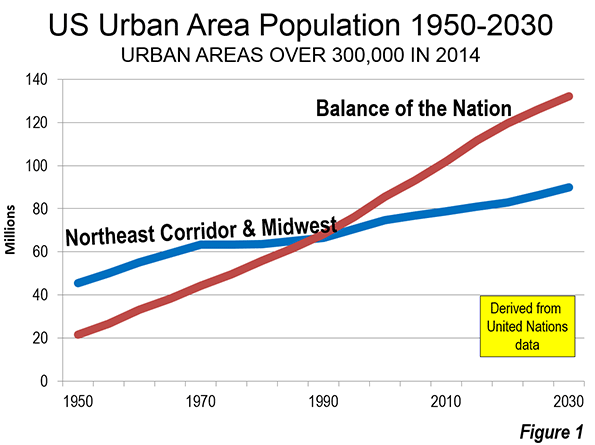 The publication provides perhaps the best summary of US urban area population trends since 1950 and also projects their population through 2030. The UN provides data for the 135 urban areas with an estimated population of at least 300,000 residents in 2014. Urban areas are the city in its physical form – the built up area (as opposed to cities in their functional or economic form, the metropolitan area, which includes economically connected territory outside the built up area, from the urban core to the suburbs to the periphery bordering farms and other rural land). The United States has undergone an urban population revolution since 1950, the first year that urban areas were designated by the US Census Bureau. In 1950, two-thirds of the population of the urban areas in the UN list was located in the urban areas of the Northeast and the Midwest (including Washington & Baltimore). By 1990, the share had dropped to one half. The UN expects this trend to continue, projecting only 40 percent of the urbanized population to be in the Northeast and the Midwest by 2030 (Figure 1). Not unexpectedly, this new urban landscape has produced substantial shifts in the rankings of urban areas. The top three cities remain the same, New York, Los Angeles and Chicago; Los Angeles overtook Chicago between 1950 and 1960. This was a stunning achievement, because during the 1950s, Chicago also was experiencing strong growth, adding approximately 1.2 million residents. This is approximately four times the 300,000 added in between 2000 and 2010. Los Angeles passed Chicago by adding 2.5 million residents, the largest 10 year increase of any city since 1950. Los Angeles continued to add more than one million residents per decade through 2000, but has since fallen into the sluggish growth pattern more identified with the Northeast and Midwest, adding less than 400,000 residents between 2000 and 2010. From today's perspective, it may be surprising that New York grew strongly after 1950, adding 1.8 million residents in the 1950s and 2.0 million in the 1960s. After that, however, the population began declining and did not recover until the 1990s. Like Chicago and Los Angeles, despite the clear improvement in many areas, population growth was small in the last decade, at 550,000. There has been little stability in the rankings of the rest of the top 10, with only two 1950s entries remaining. Philadelphia, which was ranked 4th in 1950 is now fifth. Boston was ranked 6th, but has fallen to 10th. Detroit was 5th ranked in 1950, and was 12th in 2010. San Francisco has fallen from 7th to 13th. The largest losses in ranking were Pittsburgh which fell 8th to 26th, St. Louis which dropped from 9th to 20th and Cleveland, which fell from 10th to 24th. New entrants Miami, Dallas-Fort Worth, Houston, Washington and Atlanta have replaced these cities in the top 10. The UN's population projections to 2030 indicate modest rankings changes from the present. The top 10 would remain the same, except that Boston would be replaced by Phoenix. 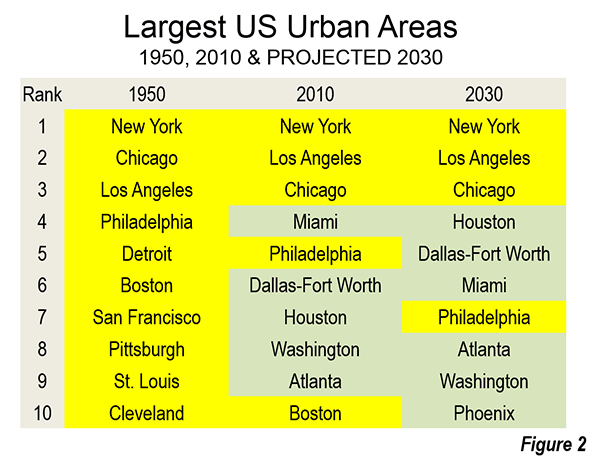 As a result, only four of 1950s top ten remain in 2030 – New York, Los Angeles, Chicago and Philadelphia (Figure 2). The rise of Phoenix is particularly impressive. In 1950, Phoenix had a population little more than 200,000. By 2030, it is projected to have 4.8 million residents. Houston is expected to rise from the 7th largest urban area in 2010 to 4th largest in 2030. Houston would thus pass Miami, Philadelphia and in-state rival Dallas-Fort Worth. Miami and Philadelphia would each fall two positions. 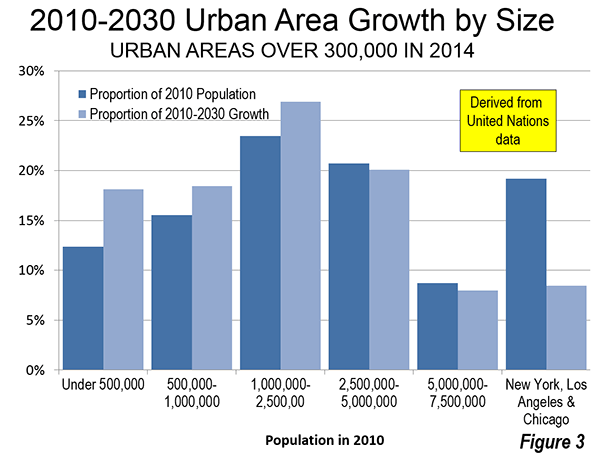 By 2030, there would be 53 urban areas with more than 1,000,000 population, up from 41 in 2010. By comparison, there were only 12 cities with more than 1,000,000 residents in 1950. 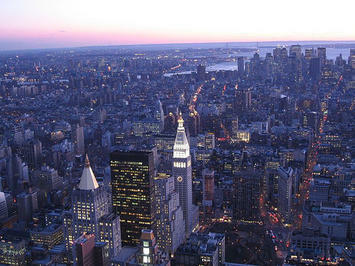 Seven of the new 1,000,000 cities are located in major metropolitan areas as of 2010. New Orleans would be restored to the over 1,000,000 list, after having been knocked out by the 2005 Hurricane Katrina and Rita events. Buffalo, however, which is the only other urban area to have fallen below 1,000,000 population (in the 1980s), will not be restored to that level, according to the UN. In addition, Bridgeport, Tucson, Albuquerque, El Paso and McAllen would reach the 1,000,000 level by 2030. The addition of El Paso and McAllen would tie Texas with California, with each having six urban areas with more than 1,000,000 population. The smaller population categories would grow faster than their population share. The cities with 1,000,000 to 2.5 million population would grow nearly 15 percent faster than their proportion of the population. Those with from 500,000 to 1,000,000 would grow nearly 20 percent more than their proportion of the population. The cities will fewer than 500,000 residents would capture nearly 50 percent more of their growth than their current population proportion. Only four of today's 50 largest cities would be among the 20 fastest growing from 2010 to 2030. Charlotte and Raleigh would rank 6th and 7th respectively, both growing approximately 72 percent. Austin would rank 11th, growing 59 percent and Las Vegas, at 14th, would grow 51 percent. The largest percentage growth would be in smaller urban areas, especially in areas near much larger urban areas. The Woodlands would grow 170 percent, nearly five times that the rate of adjacent Houston, which would itself be the fastest growing urban area of more than 2,000,000 population (35 percent). Murrieta-Temecula and Victorville would grow 100 percent and 75 percent respectively, dwarfing the 36 percent of nearby Riverside San Bernardino. Kissimmee would double adjacent Orlando's growth rate, at 78 percent. Provo is expected to grow 69 percent, nearly three times the growth rate of nearby Salt Lake City. Santa Clarita and Lancaster would grow 64 percent and 55 percent respectively, much faster than their much larger neighbor, Los Angeles, at 9 percent. South Florida cities Cape Coral (80 percent), Bonita Springs-Naples (52 percent) and Port St. Lucie (51 percent) by would grow at three to five times giant Miami. The same pattern holds even in the Northeast Corridor. Poughkeepsie, at 32 percent, would grow nearly four times the rate of nearby New York, while Worcester would more than double the growth of Boston. Fayetteville, Arkansas, an urban area that includes Bentonville, with the Wal-Mart headquarters, is the only urban area that is far from larger urban areas and projected to be among the fastest growing (80 percent). Fayetteville is more than 200 miles from both Kansas City and Oklahoma City. Of course, projections are no more than educated guesses. The emerging reality could be similar or radically different than the projections, as is always the case. Nonetheless, from the present vantage point, UN projections show continuing dispersal, as greater growth occurs in smaller urban areas, and continues to move outside the Northeast and Midwest. Note on additional resources: The United States Conference of Mayors has published metropolitan area projections to 2042. Demographia World Urban Areasprovides urban land area and density estimates for all indentified urban areas of 500,000 population or more, with population data provided by the United Nations, national census authorities and other sources. Submitted by PhilBest on Fri, 08/08/2014 - 16:47. Phoenix's growth rates are going to die like LA's did, long before it gets much bigger than it is now. This is because it is hemmed in by government owned land. In so far as the government agencies sell any sites to developers, they price-gouge as monopolists. This makes Phoenix no longer a fast-growth, low-land-cost, stable-land price, sustained-growth city like Houston is. The 2003 - 2010 cyclical volatility in Phoenix was an indicator of a future norm. It is effectively part of California now unless the land ownership debacle is resolved.